Der Artikel John W. Murphy: Narrative Medicine and Community-Based Health Care and Planning wurde in den Warenkorb gelegt. Ihr Warenkorb enthält nun 1 Artikel im Wert von EUR 74,66. This progressive resource brings the innovative power of narrative medicine to the forefront of community public health care. Chapters describe community involvement across a continuum of control, from health consultants describing problems and suggesting solutions to health committees designing programs and evaluating results. Narrative strategies to this end, including authentic dialogue and community mapping, are examined in the context of public health and fleshed out with examples of different levels of participation by community members. From the respectful collaboration modeled here, the principles of community public health care can potentially expand beyond the immediate community into other social domains on a greater scale. · Narratives, local knowledge, and world entry. · Storylines, causes, and locus of interventions. · Community mapping tells a story. · The politics of storytelling. 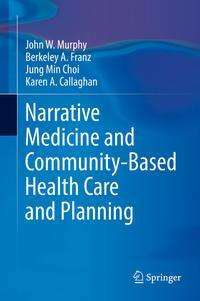 Narrative Medicine and Community-Based Health Care and Planning gives health psychologists, sociologists, social workers, and public health administrators realistic practical insights for tapping into the unique resources communities and clients have to offer. This is the next step in the evolution of public health, toward large-scale improvements in care delivery, access to and relevance of services, and patient and community outcomes.